﻿ ATV World. 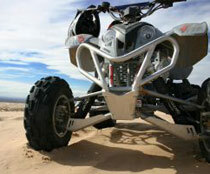 ATV, UTV, Snowmobile, ARGO Course & Rentals. ATV World Inc and Andrew Blakely are proud to be involved with Alberta Snowmobile Associations Safe Riders Program for 2011-12. We are entering into our 6th year with the program that will be starting in the fall approximately 15 Sept 2011. To involve communities in a snowmobile safety awareness campaign. To work in partnership with organizations not involved in snowmobiling to enhance the understanding of the sport of snowmobiling and safety related issues. Poster sets and a copy of the video were left at each school as resource information along with binder dividers and brochures. Sponsors also donated all of the equipment and the necessary insurance. We thank them for helping to make this program the success it was. Due to many requests and the need for ATV safety, the Association chose four years ago to incorporate ATV safety training into our program. Much of the safety messaging is similar for both ATV and snowmobile safety, so incorporating this safety segment into our program was not difficult and the full program has been well received. Sled Smart has experienced seven years of success along with positive media coverage and has presented the Safe Rider message to over 35,000 students. Coming off a great snow year in 2010-11, we look forward to another successful year of the Safe Rider Program this season. As in past years, the focus of the 2011-12 ATV/ Snowmobile safety campaign is to raise awareness of safe and environmentally responsible ATV/ Snowmobile operation targeting rural Alberta students specifically in grades one to twelve. Andrew Blakely, ASA Safety Instructor, will again be delivering the ASA Safe Rider program. If you have schools in your area that are interested in the program, please contact Andrew at (780) 220-7577 or at atvworld@shawbiz.ca for availability and scheduling information.